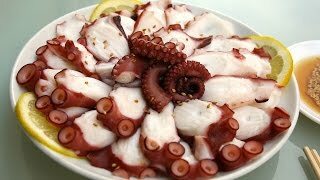 Today I’m going to show you a great way to eat cooked octopus: as tenderly cooked slices served with a nutty sesame dipping sauce. This is the traditional Korean style to eat octopus, called Muneo-sukhoe (문어숙회). When I lived in Korea, I ate octopus this way all the time. I remember one time my whole family went to visit my father’s hometown, which was on the seaside. My mom woke up early in the morning and went to the dock and waited for a fisherman to bring in fresh octopus. She came home with a large bucket filled with live octopi. All our family and some neighbors and my father’s friends came over and we had a delicious breakfast all together. My father passed away a long time ago but it always remains in my heart as a good memory. Some people like to dip octopus in chogochujang (초고추장), the sweet, spicy, and sour dipping sauce that Koreans usually make for raw seafood, called hoe (회) in Korean, but more people prefer the sesame oil based sauce in this recipe. I think the combination of octopus with this sauce is heavenly, and really allows the octopus taste to come through. You can try both and see which one you like! Most octopus in North America are sold frozen and already cleaned. They’ll work well in this recipe, too. Wash the octopus and rub it with salt, remove all slippery stuff and cook it. And as I mention in the video, be sure to save the water from boiling the octopus, you can use it to make beef and radish soup (soegogi-muguk 쇠고기무국). Just substitute the water in the recipe with the water you used to boil the octopus in, and the resulting soegogi-muguk will be even more flavorful and delicious! I filmed this video in Nice, France, where I discovered they have an abundance of fresh and delicious octopus. I was there for one week and bought 2 large octopi in that time. I ate a lot of octopus until I almost get tired of it! I have another video and recipe coming using octopus from Nice, and I have many more Korean recipes that use octopus. I’ll post more of them the next time I have access to delicious octopus like I found there. If the octopus hasn’t been cleaned, you’ll first need to clean it. Put the octopus in a bowl big enough to hold it. Gently flip the head inside out. Remove anything attached to the inside of the head, including the ink sac, until it’s nice and smooth. You can use your fingers or scissors. There’s a film on the inside of the head, remove that, too. During this process, some ink might escape from the sac and it might get black. Don’t panic! Keep it all in the bowl. When it’s all clean and smooth, flip the head outside in. Sprinkle salt (sea salt or table salt) generously over the octopus. Then rub and scrub harshly, like you’re cleaning laundry. Keep it up for a few minutes, and it will foam up. Rinse the octopus in cold water a couple of times. If it’s still slippery or dirty, rub with salt and scrub again until it’s clean. This process will not only clean the suckers but also tenderize it. Add the octopus tentacles first. Press it down with a wooden spoon to completely submerge it. Turn it over a few minutes later and bring the head to the bottom. The octopus should have changed color to red. Turn it over every a few minutes to cook evenly. If it’s cooked too long, the octopus will be rubbery, and if it’s not cooked enough, it’ll be a little translucent. The flesh should be nice and soft and white. You can test if it’s done or not by poking the thickest tentacle with a chopstick. It should go through easily. Mix ¼ teaspoon salt with 2 to 3 tablespoons sesame oil in a small, shallow bowl. Add 1 tablespoon sesame seeds. Take the octopus out of the boiling water. Quickly rinse it in cold water to stop it cooking and to keep the skin smooth and beautiful. Split the cluster of tentacles in half. In the middle of both halves will be the mouth and beak. Remove these and discard. Split each tentacle from its cluster. Cut the tentacles into thin slices and serve on a platter with the dipping sauce. Keep leftovers in the fridge for a week or freeze them for up to 1 month. To freeze, divide the octopus into whatever portions you want, then wrap each portion in plastic and freeze. When you want to eat some, take out a portion and let it thaw out a bit, which will make it easier to slice. Then serve with the dipping sauce. Posted on Tuesday, December 27th, 2016 at 8:25 pm. Last updated on December 29, 2016. Posted May 26th, 2017 at 11:16 am | Log in to reply. hi! can anyone help me? i bought and cooked a small octopus today from the frozen departement of the super market ( the fresh one were not so fresh) it was 1.5 pound so i cooked it for 6-7 min but it had a weird layer under the skin…like a fat layer, is that possible? i tried to let one tentacle in the boiling water for 12 min to see if it was just because it was undercook but it didnt change anything…? could it really be a fat layer or is it something else? Posted February 21st, 2017 at 4:36 pm | Log in to reply. Thank you for bringing me back to my parents’ roots! … Most Moonuh in Hanareum is sold pre-cooked. Would you suggest flash boiling and then cooling again? Or just slice and serve cold? Posted March 1st, 2017 at 9:37 am | Log in to reply. I would blanch it for a minute in a little salty boiling water before serving. Posted February 20th, 2017 at 2:51 pm | Log in to reply. Hi Maangchi, this octopus is very good looking. And at the end spicy hot paprika. Posted January 15th, 2017 at 11:29 am | Log in to reply. Posted January 1st, 2017 at 1:15 pm | Log in to reply. Hi Maangchi! I bought octopus sashimi and ate it with the sesame dipping sauce, it was so delicious! so much better than eating it with soy sauce and wasabi! i think this is my new favorite snack! Posted December 27th, 2016 at 11:40 pm | Log in to reply. Beautiful dish (octopus and Maangchi)!!! Can’t wait to try it! This recipe was originally posted on December 27, 2016 at 8:25 pm by Maangchi. It was last updated on December 29, 2016. The video was watched 1,548,419 times on YouTube & has 25,329 likes!